Six weeks after the birth of baby Liborio (already nicknamed Bino) Michela wrote a post in her blog talking about his first adventures in our Book PopUp. 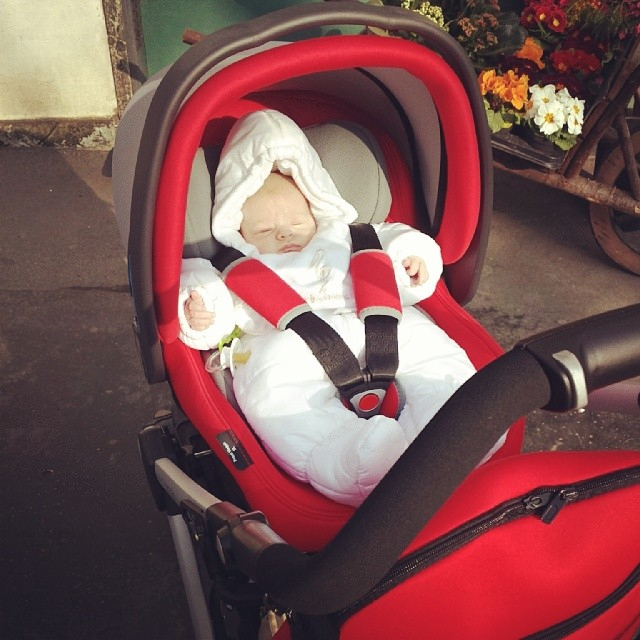 “The first time I went out with Bino was not a stroll, although it was very easy. We had to return to hospital to check the weight of a little boy who was just over two kilos, so we took a taxi. Perhaps I should have filmed the taxi driver’s expression when, with two simple moves, I removed the bassinet and handed him the chassis to put in the boot, and then again when I got out of the taxi, opened the chassis and put the bassinet on again. And I had been operated 6 days earlier! Next I went to my ASL [local health unit] to request a pediatrician and, oh dear, there were about ten steps between us and the desk we needed to reach to apply. Once again, two quick moves was all it took to remove the chassis and go up the stairs with the bassinet in one hand and the chassis in the other. Continue reading Michela’s post on her blog – you will also discover what she thinks about the large basket and the single handlebar. The photographs are of course Michela’s property but we have to say it – isn’t little Bino great?